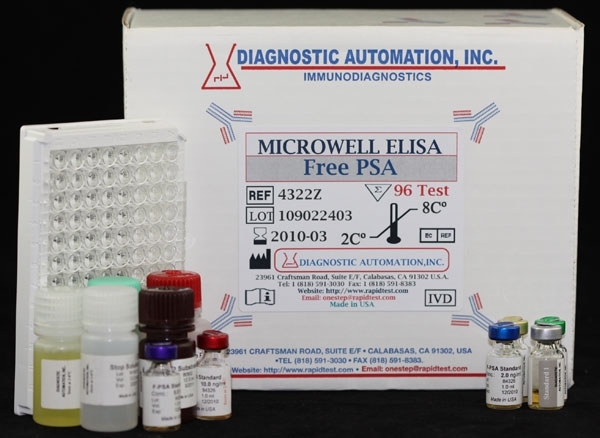 Free PSA ELISA kit | CE-GMP | 818 591 3030, USA. The f-PSA Enzyme Immunoassay test kit is intended for the quantitative determination of Free PSA in human serum. 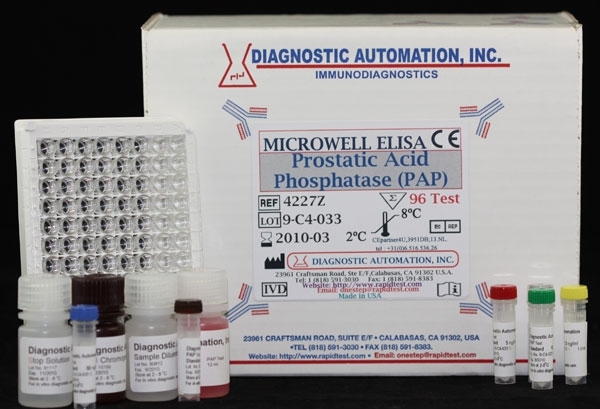 This free PSA ELISA kit is used in clinical labs, hospitals labs and reference laboratories for the purpose of screening men for prostate cancer, and benign prostatic hyperplasia. Human Prostate Specific Antigen (PSA) is a 33 kD serine proteinase which, in human serum, is predominantly bound to alpha 1-antichymotrypsin (PSA-ACT) and alpha 2-macroglobulin (PSA-AMG). Trace amounts of alpha 1-antitrypsin and inter-alpha trypsin inhibitor bound to PSA can also be found. Any remaining PSA is in the free form (f-PSA). Current methods of screening men for prostate cancer utilize the detection of the major PSA-ACT form. In the Free PSA ELISA kit, Levels of 4.0 ng/ml or higher are strong indicators of the possibility of prostatic cancer. However, elevated serum PSA levels have also been attributed to benign prostatic hyperplasia and prostatitis, leading to a large percentage of false positive screening results. A potential solution to this problem involves the determination of free PSA levels. Preliminary studies have suggested that the percentage of free PSA is lower in patients with prostate cancer than those with benign prostatic hyperplasia. Thus, the measurement of free serum PSA in conjunction with total PSA, can improve specificity of prostate cancer screening in selected men with elevated total serum PSA levels, which would subsequently reduce unnecessary prostate biopsies with minimal effects on cancer detection rates. 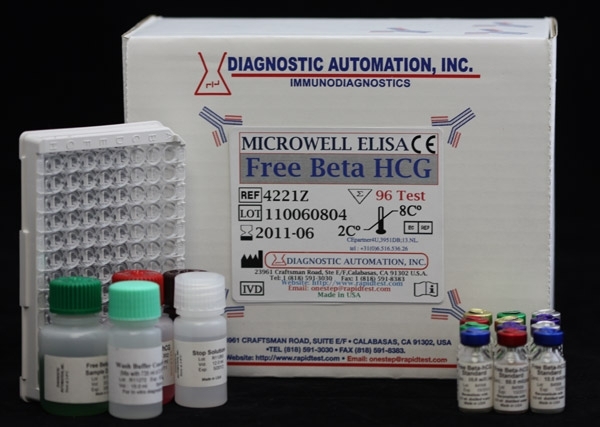 The free PSA ELISA test kit is a solid phase two-site immunoassay. An anti-f-PSA monoclonal antibody is coated on the surface of the microtiter wells and another anti-PSA monoclonal antibody labeled with horseradish peroxidase is used as the tracer. The free PSA molecules present in the standard solution or serum are "sandwiched" between the two antibodies. Following the formation of the coated antibody-antigen-antibody-enzyme complex, the unbound antibody-enzyme tracers are removed by washing. The horseradish peroxidase (HRP) activity bound in the 96 wells, are then assayed by a colorimetric reaction. The intensity of the color formed is proportional to the concentration of free PSA present in the sample. 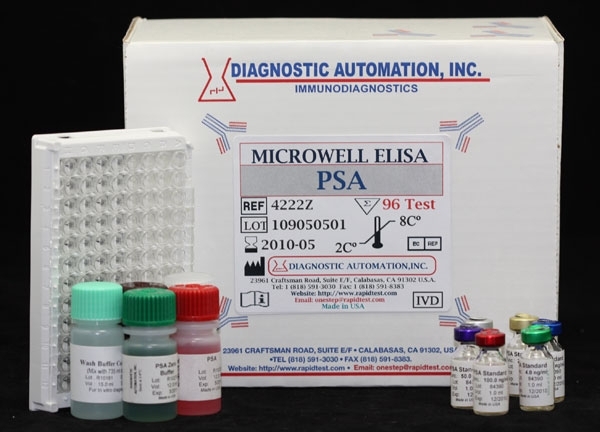 The free PSA ELISA kit can be run on an ELISA reader such as Diagnostic Automation, Inc. DAR800 reader and DAW50 washer. 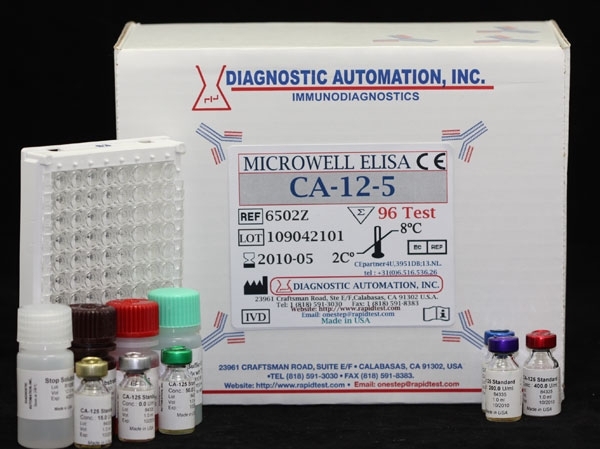 Diagnostic Automation Inc. also provides other Cancer ELISA Kits. 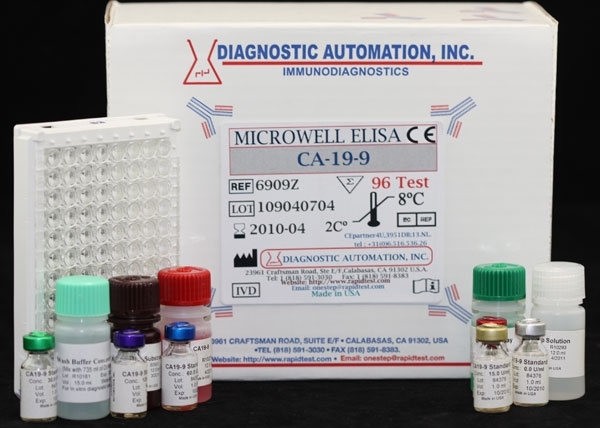 For more information about these ELISA Kits or Rapid Tests, IFA Kits, CLIA Test Kits, or Serology tests, please see our website home page, or contact our Customer Service Representative at 818-591-3030.